Eat This. Sassy Magazine Said So. When Sassy magazine folded in 1994*, there wasn’t an immediate outpouring of cultural loss like the mass eulogies honoring the end of LIFE magazine’s run in 2000. Understandable but depressing just the same for those of us for whom Sassy was a lifeline and a pipeline. In the decades since its confusing and stil-too-untimely demise, the tide has shifted. Copious articles, books (How Sassy Changed My Life ), blogs, and even live tribute performances have dissected the importance of Sassy, posthumously recognizing it as the smart, irreverent, and generation-defining voice that it was. These pieces have said it well and I won’t repeat their words, but suffice to say, if you’re in awe of the work produced by a clever and intelligent twenty- or thirty-something woman today, chances are you have Sassy‘s influence to thank. Certain pages from the magazine** remain Xeroxed in my mind—young Angelina Jolie and Amy Smart as models; the great junk food taste off; “daggy;” the pillowcase dress; the skirt made from ties; Chlöe Sevigny in her self-sewn hat, overalls, and nose ring; the Kurt and Courtney issue; excerpts from Blake Nelson’s Girl ; Tom Maginnis as the only member of Buffalo Tom singled out in “Cute Band Alert;” Mayim Bialik wearing an American flag turban; Glen Phillips from Toad the Wet Sprocket as “One to Watch”—and two recipes: Evan Dando’s chocolate sauce and Sonic Youth’s tuna fish tacos. 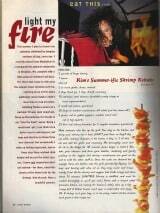 Yes, from February 1992 to March 1993, Sassy‘s last page was devoted to the column “Eat This,” which featured recipes and the stories behind them from staffers and whatever celebrities they could coerce into contributing. 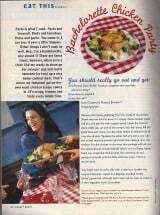 In keeping with the magazine’s “diet is a dirty word” editorial philosophy, the recipes weren’t accompanied by any notes on how low-fat or waist-whittling they were; though Andrea L.’s Bachelorette Chicken, Kim France’s shrimp kabobs, and Noel’s pasta primavera can all be deemed “good for you,” that’s not the point of sharing the recipes. And their relative healthiness is more than offset by Margie’s hamantaschen and Christina & Mike’s real-butter-and-whole-milk mashed potatoes. 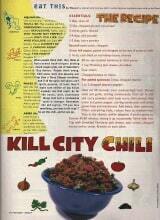 I confess that I never made a single recipe from the column. 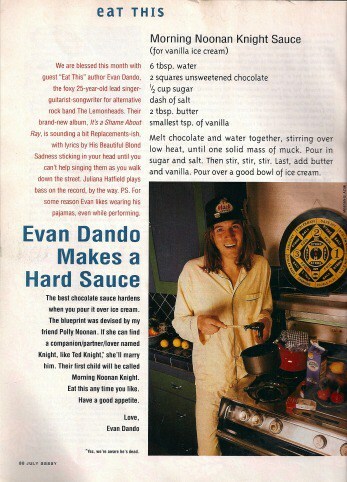 I read every word religiously, can still remember that Evan Dando called his recipe “Morning Noonan Knight Sauce” because he wanted Polly Noonan to marry Ted Knight and have a child named Morning, but never actually tried any of the dishes. Even though my kitchen experimentation didn’t start in earnest until college, I feel I can still credit Sassy for supporting the idea that cooking is fun, easy, and cool, not something that should be weighed down by ideas of calorie counts and ingredient shame. 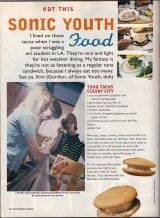 And if Kim Gordon wants to make a taco that’s spread with butter, then hot damn, I want to eat that too. When Danielle and I were conceptualizing Good. Food. Stories. 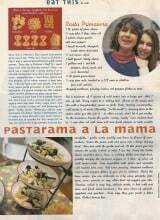 in 2009, one of the lines in our original mission statement was “we were blessedly lucky to make it to college without developing or even encountering a lot of the food hang-ups that plague a lot of ladies of our generation.” We just wanted to share the enjoyment of eating well, not just subsisting on deli salads with balsamic dressing to maintain a figure. Given that nearly every page of the magazine is still burned into my brain, I’d like to give another hand to Sassy for perpetuating that healthy image. 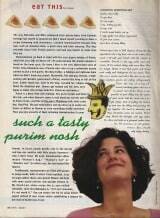 The (almost) complete lineup of “Eat This” columns appears below—my October 1992 issue is lost to the ages, I’m sad to say, and a few recipes are missing photos that I clipped for use in collages or to wallpaper my bedroom. (I had quite the thing for the Beastie Boys and Spike Jonze, so I’m sorry that you won’t see Mike D and Spike’s mugs posing with their carrot cake.) Click on any of the thumbnail images below to see a larger version. 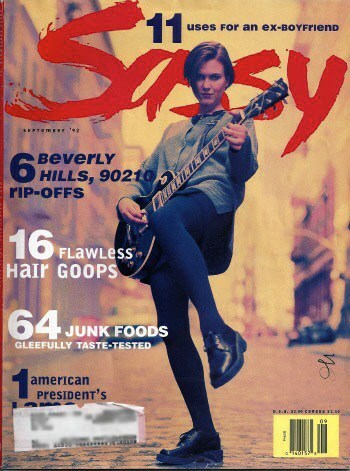 *Although Sassy published issues from 1995-1996, they weren’t produced under the same Jane Pratt-led staff; most consider the November 1994, the last under Jane & Co, to be the final issue of the magazine. 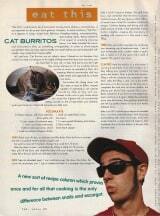 In 1996, the magazine was incorporated into Teen magazine and really, definitively, truly ceased to exist. **And if you scroll down to the “Who Would You Elect First Lady?” article on the linked post and read the answer from Jason, 15, you’ll notice the name of yours truly. I was a Sassy intern for one brief, shining week in August 1992 and this piece is my first mention in a national print publication. We all gotta start somewhere.